JDM tuner gives the plain Prius an aggressive look. Prius owners looking to hotrod their hybrids should grab their credit card and English to Japanese dictionary. Tommy Kaira, the famous Japanese tuner best known by Americans from Gran Turismo, is now offering a range of performance parts and body kits for the car. The body kit includes a new front bumper, a rear bumper with diffuser and side skirts. The kit really does manage to improve the rather mundane look of the car and is almost what you would expect if Toyota sold the Prius as a Scion. An odd touch is four exhaust tips which may be going a bit too far. Tommy Kaira is also selling an improved brake kit and a variety of wheel packages. The largest of the wheels are in a mile-per-gallon-killing 18 inches. To round out the package, the Japanese tuner also offers a performance suspension kit that will lower the Prius several inches and a special steering wheel. Sundry items like special floor mats and seat covers are also available. There is no official data on the effect these modifications will have on the hybrid’s gas mileage, but one could assume it will likely make it worse. Once you swap out the wheels with a heavier set and put on a body kit that will likely ruin the carefully engineered aerodynamic shape, it may defeat the whole reason why a person would buy a hybrid in the first place. It would of been interesting if a solar panel spoiler would of been included. 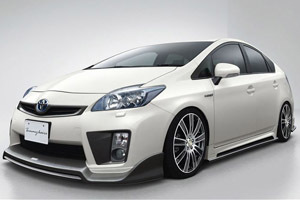 Prius performance products will appeal likely to a small audience and it’s unlikely that these JDM products will ever see acceptance in the United States. The Prius is seen almost as a status symbol in the US that is enjoyed by the average person and the rich and famous. These people are unlikely to change anything that affects the rather iconic look of the Prius. It’s only a matter of time before some crazy tuning company offers a turbo kit for the Prius. Um Priuses get 50MPG not 20MPG even if you have a lead foot the prius will still get you 30-40s I speak from experience. TDIs are nice but they’re expensive and require more maintenance (timing belt, turbos, etc…) A prius pretty much all you do is change the oil and drive it. Now if VW would come out with their hybrid TDI…. This is the problem this is not a hot rod but is driven that way.It negates it’s purpose.It was never meant to be beautiful it was meant to achieve high mileage.Only if you are a patient slow and steady driver.South Park got it right when they renamed it the Smug because it’s driver misuse it .They use it as a fashion statement more then what it was meant for.That’s why these drivers should be driving the Jetta TDI .Because it can be driven hard and keep it’s high mileage .I just laugh when I get cut off by a Prius /Smug because they are getting 20mpg in there hatch back and I am comfortable in my Passat getting near 30mpg .Diesel is the answer until plug in can be made more reliable and not leave you stranded.